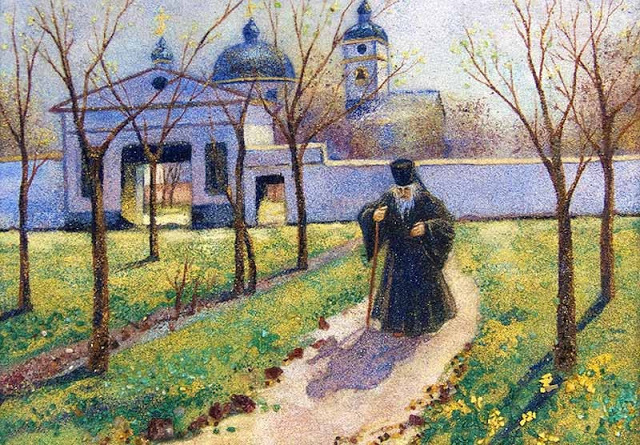 “The priest prays for the people, and with the people, but not instead of the people”. I usually admonish them with this saying when I am announcing one of the very rare occasions when I will be gone on a weekend, to teach them that they are responsible for prayer in the church; this is not something that is the sole responsibility of the clergy. I am trying to minimize any of the mice “playing” when the cat is away! My little aphorism is not just an admonishment; it is also shows the equality of the clergy and the people when we are addressing our prayers to God. With rare exceptions, the priest (and deacon and bishop), with the people face toward the East when they pray. 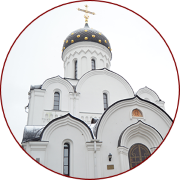 “East” is, liturgically, in the direction of the altar, whether it faces true East or not. 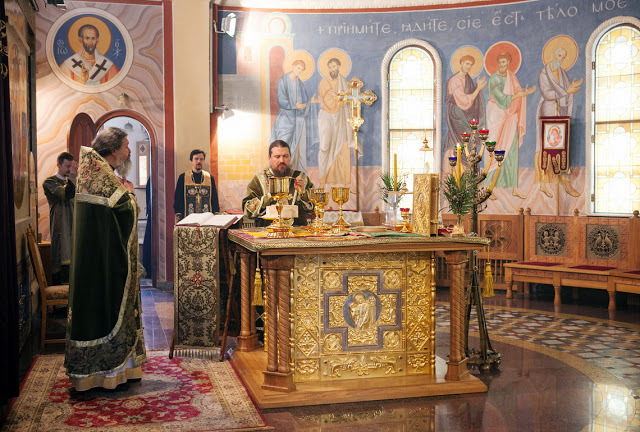 In a traditional church, “built from scratch” the altar always is to the East; in our modern world, where there are many buildings that are modified to use in worship, sometimes it is not possible for the altar to face true East. If there is no altar present (such as when we have molebens in front of the cross on our land in McKinney, where God willing, we will have a new temple built by late summer 2009), everybody still faces in the same direction. We believe that our Lord ascended on the Mount of Olives, and when He comes back, He will come on a cloud from the East. Therefore, we face East when we pray. There are other important biblical references to the East. The following is a NON-comprehensive list. 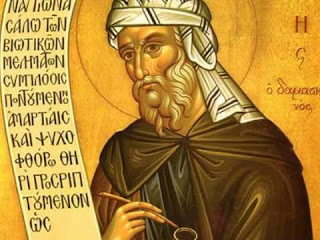 There are lots of references in the Fathers to prayer facing East (see the end of this essay for an excerpt from St John of Damascus concerning this.) 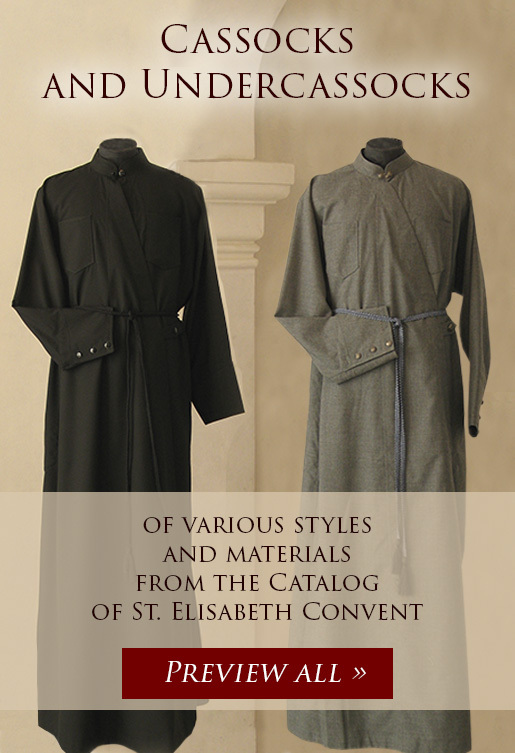 It has been a uniform part of our tradition since BEFORE Apostolic times. When the people pray, they all pray together. We are all God’s children. Does it make any sense for the people to face God, and the celebrant to turn his back to God during prayer? He cannot lead prayer when facing the people; he becomes a focal point for prayer; the people are facing him! 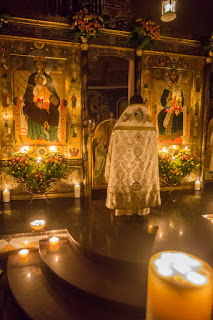 One can see how dangerous this practice of having the celebrant face the people by observing the excesses that have occurred in the sectarian churches (Full disclosure, please see the note at the end of this essay). Just driving down the road and looking at billboards shows that the “mega churches” do not share our “mind”. Their billboards feature prominently the picture of the pastor, usually with his pretty wife and 2 pretty children, a boy and a girl, all smiling beatifically at the masses, or perhaps some other “beautiful person” gushing about how they have finally found a church they can believe in. So much of, (what shall we call it? “mainstream” or “sectarian” or “Protestant”) worship has become about personality. At look at the “mega” and even small country churches shows a wholly different way of worship than the ancient Jewish/Orthodox way. The “altar’ area is a stage, flanked with large TV screens, which show flattering close-ups of the pastor as he preaches, or the music minister as he performs. 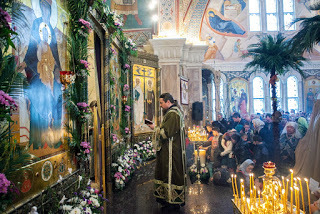 Contrast this with true, traditional Orthodox worship. The celebrant stands, usually in front of the altar, with a serious and sober demeanor, and the people stand with him, all symbolically facing God, to the East. The people much about piety from the way the celebrant and deacons serve. All is done carefully, soberly, with thought and good order. Even the Roman Catholics have begun to realize the excesses that can happen when the priest faces the people when he liturgizes. The current Pope (Benedict) is a strong advocate of ending this innovation and he celebrates the liturgy facing, with the people, in the direction of the altar. When the pastor teaches, he faces the people. This was the Jewish way as well; Christian worship is inherently Jewish. For everything, there is a time and a season, and when the pastor teaches, he faces the people, so they can hear his exhortations. It makes no sense (and is rude) to speak to people with our back to them; in the same way, it makes no sense, and is rude, for us to pray to God while turning our back to Him. Since, therefore, God1 is spiritual light 2, and Christ is called in the Scriptures Sun of Righteousness3 and Dayspring,4 the East is the direction that must be assigned to His worship. For everything good must be assigned to Him from Whom every good thing arises. Indeed the divine David also says, Sing unto God, ye kingdoms of the earth: 0 sing praises unto the Lord: to Him that rideth upon the Heavens of heavens towards the East.5 Moreover the Scripture also says, And God planted a garden eastward in Eden; and there He put the man whom He had formed6: and when he had transgressed His command He expelled him and made him to dwell over against the delights of Paradise, which clearly is the West. So, then, we worship God seeking and striving after our old fatherland. Moreover the tent of Moses7 had its veil and mercy seat8 towards the East. 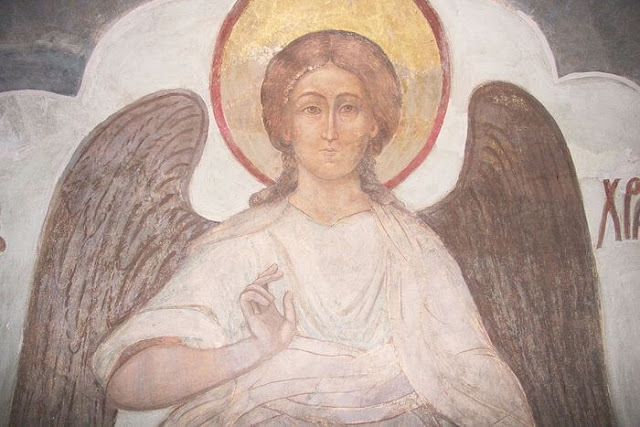 Also in the celebrated temple of Solomon, the Gate of the Lord was placed eastward. Moreover Christ, when He hung on the Cross, had His face turned towards the West, and so we worship, striving after Him. 1 St. Basil, On the Holy Spirit, ch. 27. 12 St. Basil, On the Holy Spirit, ch. 27. 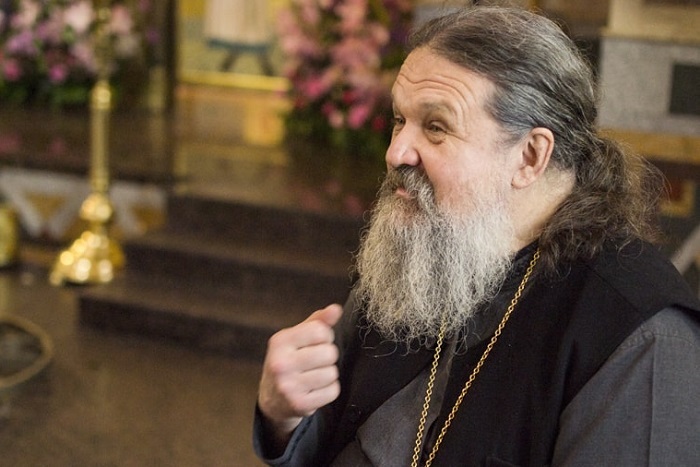 How Do We Know that We Have Divine Grace?